Predator drones like this will begin patrolling America's border with Canada. 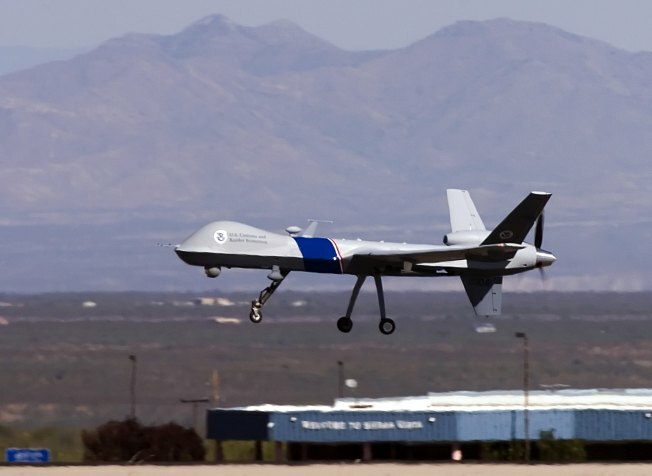 That's the apparent fear behind U.S Customs and Border Protection's recent move to deploy a Predator drone to patrol America's northern border. The unmanned aerial drone, similar to those used to hunt terrorists in Afghanistan, will be deployed from North Dakota to patrol America's border with Canada. Sen. Kent Conrad, D-N.D., said the state’s congressional delegation had been working for four years to get the unmanned aircraft to North Dakota. “It is vital to America’s security that we protect our borders, particularly the northern border,” Conrad said. The Urban Institute has estimated that about three percent of America's illegal immigrants hail from the Great White North. The Predator weighs 5 tons, has a 66-foot wingspan and can fly undetected as high as 50,000 feet. It can fly for 28 hours at a time and will be equipped with sensors and radar. The drone is scheduled to begin patrolling the northern U.S. border in January. The $10 million drones have been in use along the southern border with Mexico since 2005, where they have been largely ineffective.